has this ship been abandoned? No, I’m just massively behind. How many missile pods does it have and what kind of missiles does it carry? Looks to be about 728 tubes, capable of carrying 1 heavy anti-capital ship missile/many smaller missiles per tube. So how long is this beast? It’s built on a cruiser hull, so I’d guesstimate 3-4KM? Maybe 2.5-3 if it’s particularly small. Yeah now just imagine a missile Dreadnought! Pure Armageddon! This looks like someone from the Star Wars galaxy took inspiration from Macross and designed a ship with ALL THE MISSILES! The bridge tower needs to be lower to the hull. Like keep the current Procurator design but have it start immediately at the slanted section without any of that additional decking. That would help it so much. I’m also going to say again that I think the rear needs to be more Super Star Destroyer in design, with a dovetail section. That will offset the narrowness of the forward hull and make the design look a bit more balanced. Weapons: 100 Heavy Hextuple Turbolaser Cannons, 16 Heavy Concussion Missile Launchers. Also it clearly isn’t Hextuple they are DUEL did you even look at the turrets properly? Note that these specs are described as apocryphal, i.e. of doubtful authenticity (Merriam-Webster’s definition). Length, crew complement and carried craft complement may be accurate (though we’ve yet to see any bays on this ship), but the weapons specs were apparently written by someone who didn’t take the ‘missile cruiser’ part of the name seriously enough. Also, having looked at the in game model, even that has 18 launchers. Well it made sense for that model but not for this model. 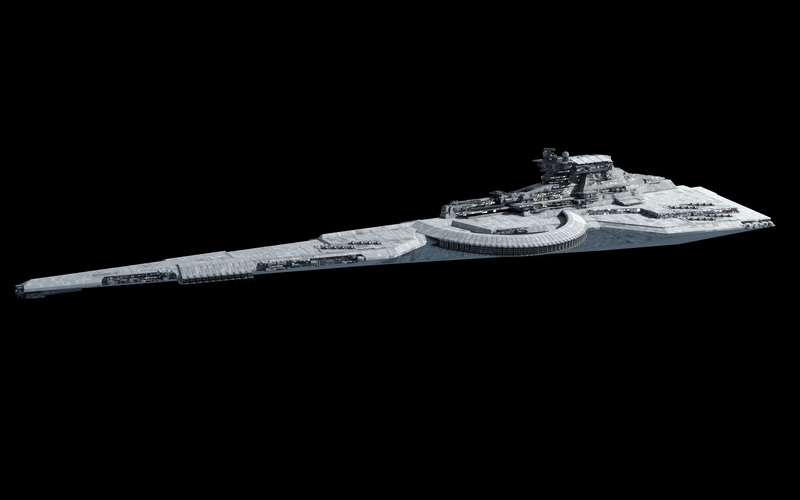 Also I doubt it carry 3 squadrons of fighters that’s like around star frigate standard fighter complement. 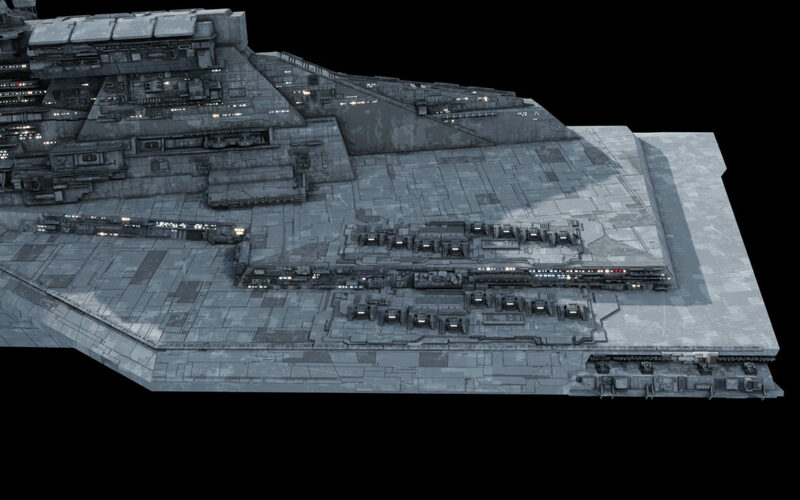 I think it carry around 2-4 fighter wings and few shuttle bays but no dropships and land vehicles. “Hex”tuple turrets? As in Turrets with whopping sixteen barrels? Yea no, I doubt such a thing is even logically possible nor desirable as having four Quad Turrets gives much more versatility than a single Hextuple one. I’m afraid I can’t take these stats seriously. Even if the 48 Venator-style heavy dual TL-turrets on this specific design are a creative design choice by Fractal (to emphasize its late-Republic origin) it is more realistic for the ship to have than ominous unknown Hextuple turrets. Actually Sephiroth it is 6 barrels if it were 16 it would be called sedecuple or the alternative name hexadecad. Also Hextuple is a alternative name for well… Sextuple. I think we can all agree that those stats are pretty meaningless and completely divorced from this render. The Tyrant-class doesn’t have a dovetail section in its design to begin with. This isn’t a new design Fractal came up with but an already existing one of which even game models already exist. Changing the bridge design around doesn’t do much of a difference but you simply don’t go and change the entire hull layout around as that would change the entire form of the vessel making it no longer the design that was commissioned to be done. Like I said experimenting a bit with the bridge layout is certainly okay as it doesn’t completely change the overall form of the design, but changing the hull form would be a significant change which affects the entire package. If it would be a totally original design this would also be feasible, but here we have an adaption of an already existing design even if it is ultimately a fanon one. 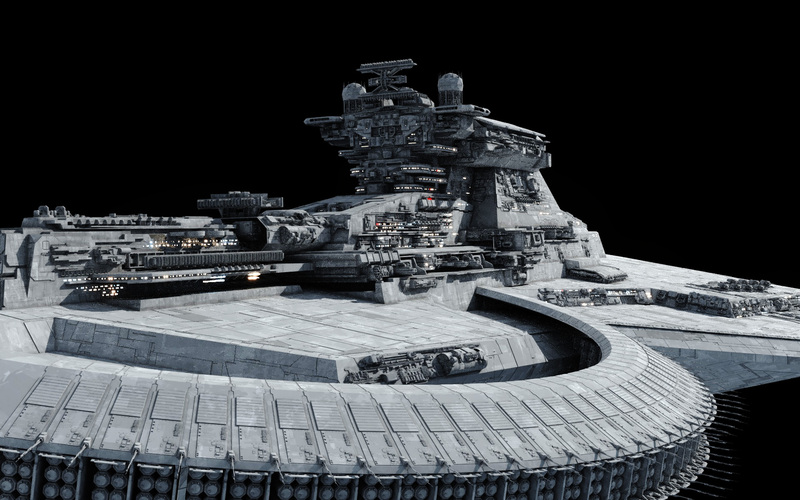 The command tower looks good and this cruiser looked like it came from the unkown regions. 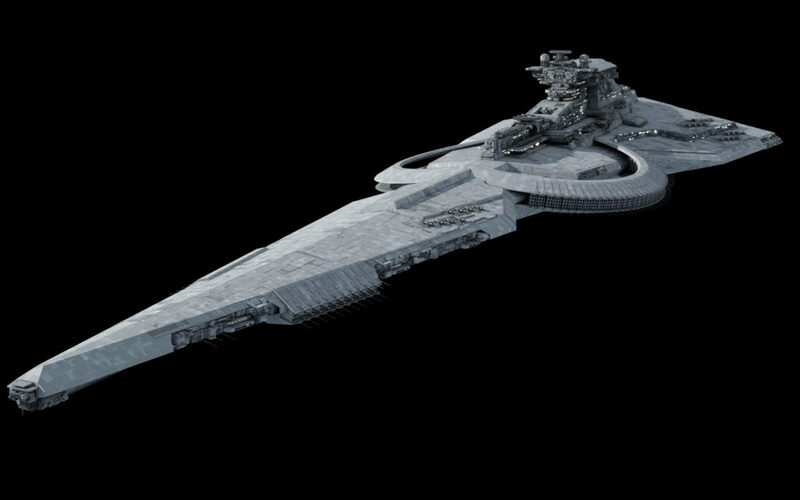 so ive been inspired by your designs and making similar star destroyers in avorion but this is definetly where i draw the line no way am i gonna be able to make that with voxels XD. So I was curious as to what the armament was for this was and I did some math and here is the number of missile tubes and turrets for those that are interested. 16 turrets up front in between each set of missile tubes with 8 on each side in batteries of 4. Yup that looks about right. Do the missile silos on the front open up like on the Victory? From the distance it almost looks like the Munificent-class’s bridge. Interesting change! Agreed. Love the rougher/unrefined character of this vs. the Imp Star version. Looking menacing. I assume this would need a couple of munitions carriers for support to keep it in action for any length of time. do we have any designs of munition carriers? Fractal has designed two logistics ships, the Altor class and the Contentor class, but both are multi purpose ships, used for refueling and presumably carrying all the standard logistical support needed to keep ships and their crews going. Any freighter of large enough size can carry munitions, but perhaps there might be a dedicated design used to carry munitions specifically, and capable of loading them into launchers like these. Otherwise it would probably be very time consuming to reload the launchers. The cruisemissile assault craft is a one-man air support platform, according to the Wookieepedia write-up. How does that apply to reloading heavy missiles on something the size of the Tyrant? Too small for the job. Even the smaller missiles for this would be akin to large ballistic missiles in naval usage. It would make more sense to have something in the Contentor size range, or a little smaller, that could approach the ring and load 2-8 at a time. 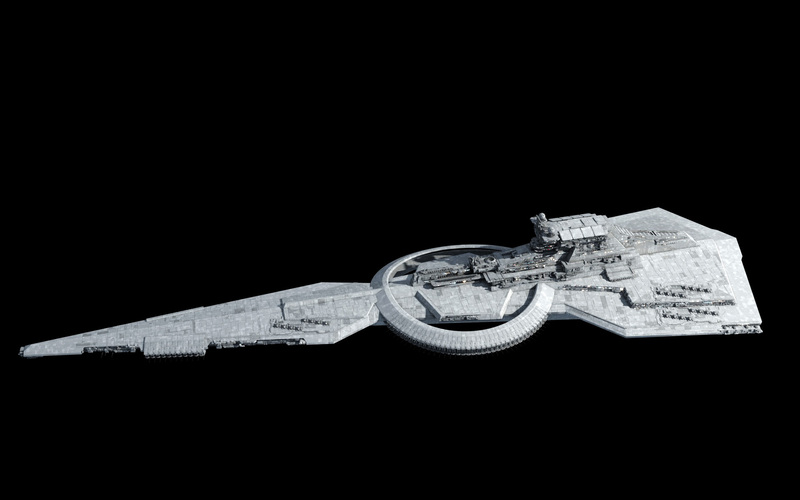 I imagine there is an internal rail/repulsor system which loads the missiles from a main munitions store, so it can all be done internally and very, very quickly. Makes no sense to have small dinky craft milling about the outside, loading missiles from the outside while in combat. Like the MTT train from TCW? Not a fan of design but that command tower, marvelous, just marvelous! 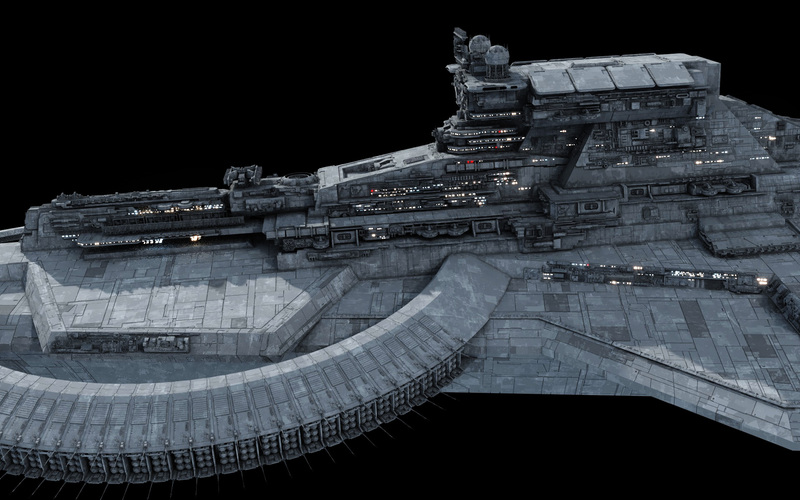 I know the ventral hull is unfinished and all, but you think we could get a better angle on it? I’m curious about the overall lines of the ship.